"Breast Cancer is Everyone's FIGHT!" Welcome to the Yolanda E. Williams Foundation website! Thank you for taking the time to learn about our organization through this website. The inspiration for starting this foundation was due to the loss of my wife for 18 years, Yolanda E. Moore-Williams (Yogi). Yogi lost her battle with Triple Negative D.C.I.S. Breast Cancer one year after being diagnosed. I started this foundation because I made a promise to her that I would keep fighting for her and others to help find a cure for this debilitating disease. If you would like to help the foundation or learn more about us and what we are doing, please do not hesitate to contact the foundation. 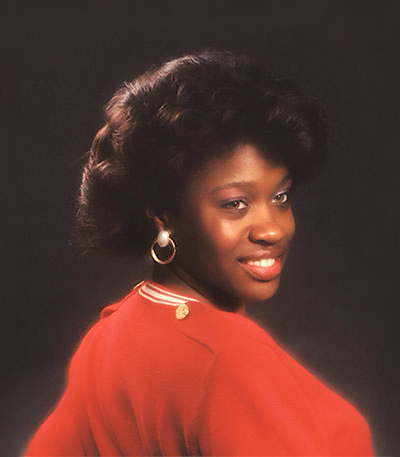 By all accounts, Yolanda E. Moore-Williams, RN, BA, MBA & MHA was living a charmed life. She had a loving husband (of 18 years), two beautiful teenage daughters, was well-educated in journalism, nursing, hospital administration and business, and highly successful in her career as COO of a hospital in the medical center. However, everything changed one faithful evening in June 2010 the moment she felt a lump in her breast. Given Yolanda’s medical training, she knew that something was wrong. Yolanda and her husband immediately went to the doctor to have it checked out. Her primary care doctor misdiagnosed her initially but Yolanda persisted because she knew her body and knew something was wrong. She kept fighting & pushing her primary doctor to run more tests. Finally, after a couple of weeks and multiple tests, she received the results of an MRI Mammography (the best test for young women with ample breast). Yolanda was told that the lump was Cancerous. 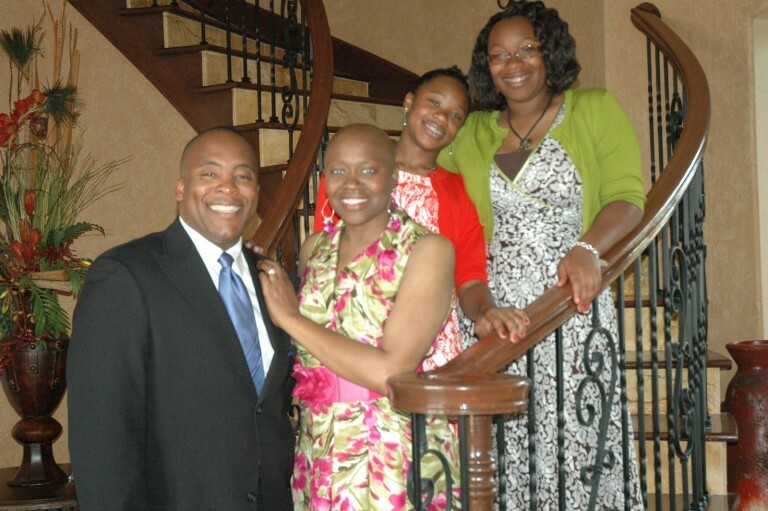 Yolanda was diagnosed with Triple Negative Ductal Carcinoma In Situ Breast Cancer. This particular form of breast cancer is very aggressive and disproportionately victimizes African-American, Hispanic, and younger women. Yolanda’s particular strain of Triple Negative D.C.I.S. Breast Cancer occurs in less than 2% of the entire population of women who have Breast Cancer. Women who are diagnosed with this strain of Triple Negative D.C.I.S. Breast Cancer have historically experienced a low mortality rate. Within a year (June 17, 2011) of her diagnosis, Yolanda succumbed to the disease. Leaving behind two girls (16 and 13 years old) and her spouse. In August of 2011 her husband founded the Yolanda E. Williams Foundation in her memory and honor. Since Yolanda’s passing the foundation has held an annual Breast Cancer Walk for Hope. The foundation has raised funds towards finding a cure for this particular aggressive strain of Triple Negative D.C.I.S. Breast Cancer. The foundation has supported the research being performed by the Baylor College of Medicine Lester & Sue Smith Breast Cancer Center. Invite your family, friends, business & organizations to join us as we walk to save lives & end breast cancer. The “WALK FOR HOPE” is an effort to raise our communities’ awareness of breast cancer by reducing risk, early detection resulting in better outcomes, treatment, and the need for a reliable and permanent cure. Increased awareness has also heightened the number of women receiving mammograms and the number of breast cancers detected. 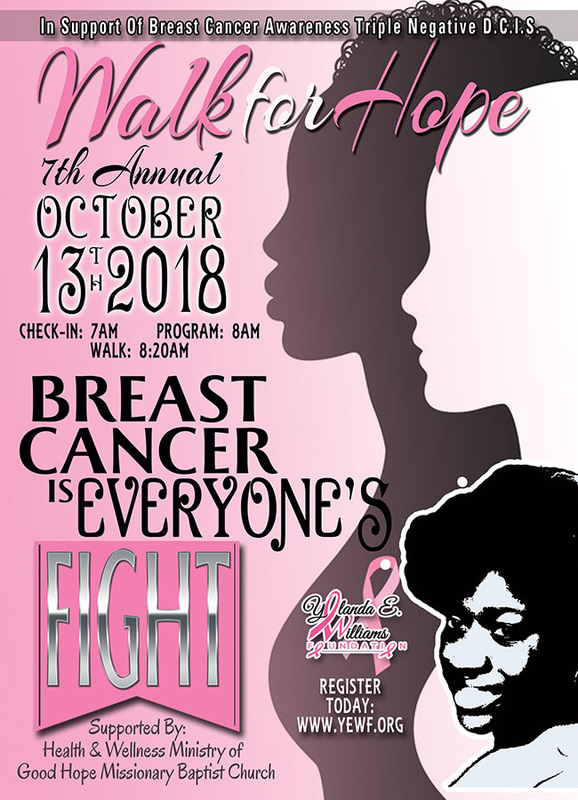 The Health and Wellness ministry is supporting the Yolanda E. Williams Foundation Breast Cancer Awareness “WALK FOR HOPE” in memory of Yolanda E. Williams and other family members who have lost the battle or are presently battling against breast cancer.